The Capitolaires on Super Tuesday sang for seniors at four assisted living facilities. 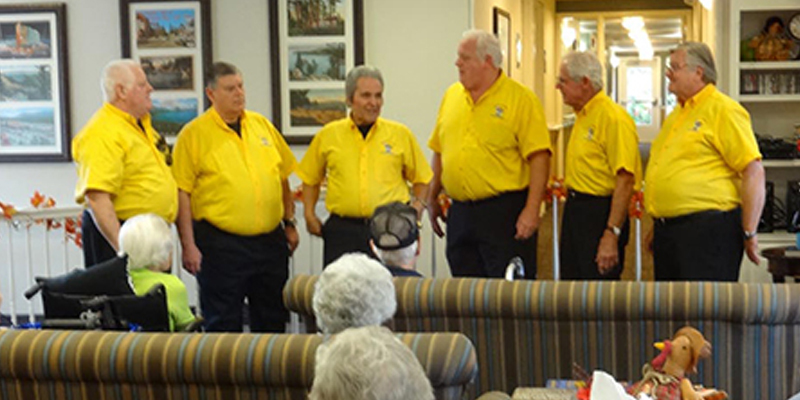 Robert and the CAPS have performed for seniors in the past and they realized how important music is to residents in assisted living facilities. The CAPS agreed and an ambitious plan was set in motion to travel up highway 50 and sing at three assisted living centers: New West Haven, Eskaton – Cameron Park and the Lighthouse at Ponte Palmero.The Folsom Lake Community Concert Associtaiton helped to sponser this outreach. The beautiful harmony and warm personalities of these singers reached out to about 150 residents that watched and sang along to songs that opened their hearts and minds. This entry was posted in FLCCA Outreach, Senior Outreach. Bookmark the permalink.